AVI. 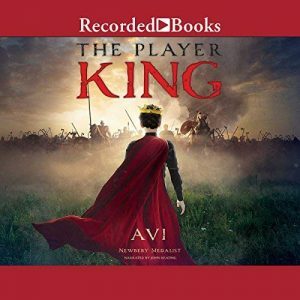 The Player King. 4 CDs. 4:45 hrs. Recorded Bks. Feb. 2018. $46.75. ISBN 9781501983023. digital download. Gr 5-8 –It’s 1486, and orphan Lambert Simnel is eking out an existence as a kitchen scullion at Tackley’s Tavern in Oxford, England. His life changes abruptly when a mysterious friar appears, buys Lambert, and whisks him away under the cover of night. The friar insists Lambert is really Edward, the Earl of Warwick, rightful heir to the English throne, and he has simply misremembered his personal history. Lambert narrates his own story, describing how the friar tutors him in English history, manners, and how to act like a royal. The stakes grow increasingly high as Lambert assumes the persona of Edward and leads an army into battle against Henry VII. Narrator John Keating convincingly portrays Lambert as an innocent pawn in a life-or-death power struggle, and his use of different voices helps differentiate between Lambert’s own internal musings and the authoritative voices of the adults that control him. VERDICT Hand this fast-paced, accessible tale to fans of Avi’s other historical fiction titles or to readers who enjoy stories set during medieval times. –Anne Bosievich, Friendship Elementary School, Glen Rock, PA This review was published in the School Library Journal July 2018 issue.